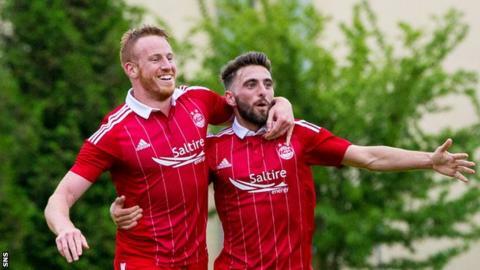 Derek McInnes believes Aberdeen have the confidence and experience to overcome being underdogs against Maribor in the Europa League. The Slovenian club has knocked Hibernian, Rangers and Celtic out of Europe in recent seasons. Yet McInnes is adamant that his players are not fearful of the quality of the opposition or their record. "We're not daunted by it," McInnes said. "We're confident in our ability to get the right result." Aberdeen's manager has told fans to expect an assertive first-leg display on Thursday and urged them to back the team. "We've learned over the last few seasons to deal with European football," McInnes continued. "I like the technical and tactical part of it. Our supporters should expect to see a confident Aberdeen team. "They are favourites, we're the underdogs, but we were underdogs against Riejka [last season], we were underdogs against Groningen [in 2014]. "They'll take confidence from their recent history, and not just against Scottish teams. "We want to represent ourselves first and foremost, get the reputation of our club at the forefront of people's minds, and help Scottish football at the same time. "Those first two rounds always have trepidation about them, because players aren't fully up to speed, they're playing against teams that are relatively unknown and there's pressure in that. "We've now come out the other side of those ties and we're now the underdogs going into this game. I'm happy to deal with the favourites tag and happy to deal with the underdogs tag." McInnes warns that Maribor will be accomplished and dangerous opponents in the first leg of the third qualifying round tie on Thursday at Pittodrie. He will send his side out in search of a victory, but also with the awareness that the contest can be won in Slovenia on away goals, so keeping a clean sheet is important. "What was telling from [Maribor's win over Levski Sofia in the last round] was their maturity and calmness, even when they went behind they kept playing their game," McInnes said. "That comes from playing European football and they look like a team confident within their shape. They've got a way of playing, very well organised, and the refusal to panic when they went behind has got them through into this tie. "They play 4-4-1-1, they can play a bit deeper and they counter-attack quickly. We need to be aware of that and recognise the areas where we want to play and look after the ball, especially against a team that is quick to get forward. "We want to win the game at home, [but] it's important we still have a result going over to Maribor. "Ideally we want to impose ourselves and get that balance between attacking and defending right, but we don't want to be giving ourselves a mountain to climb by losing goals at Pittodrie."